Jordan Budhu, Prof. Rahmat-Samii’s student, received 1st Place in the ’19 Ernest K. Smith USNC-URSI Student Paper Competition. 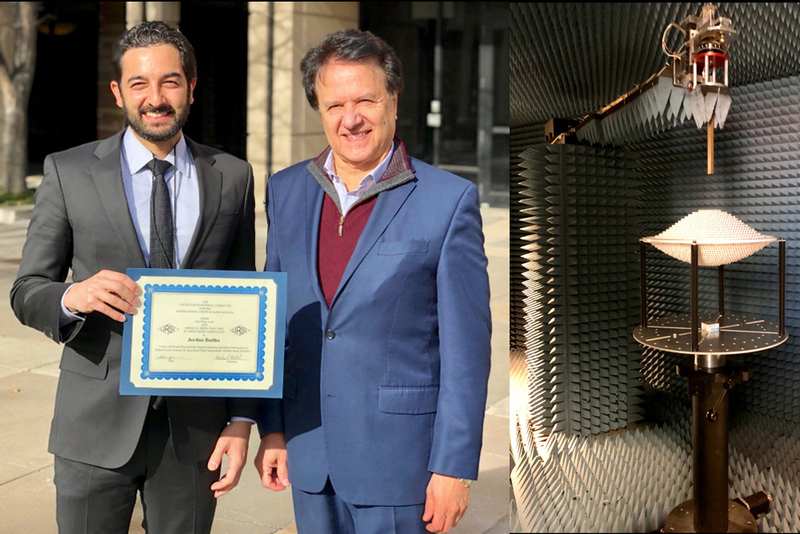 Jordan Budhu, a PhD student of Professor Yahya Rahmat-Samii’s group, received First Place and the prize money in the 2019 Ernest K. Smith USNC-URSI Student Paper Competition Award for his paper entitled “A New 3D Printed Electronically Scanned Spinning Spot Beam Inhomogeneous Dielectric Lens Antenna for Spaceborne Wind Scatterometer Weather Radar Satellites.” This was presented at the USNC-URSI Conference in Boulder, Colorado (January 2019). This conference is sponsored by the United States National Committee (USNC) for the International Union of Radio Science (URSI). The conference is also co-sponsored by The National Academies of Sciences-Engineering-Medicine and the IEEE Antennas and Propagation Society and covers diverse topics of the ten commissions of URSI addressing all aspects of Radio Science. The work was collaborated with JPL colleagues and appeared in the “JPL 2018 Technology Highlight” report as the first item of innovation. The right photo shows the 3-D printed lens in the UCLA Antenna Bi-Polar Near Field Measurement Chamber.